When it comes to getting inked, One Direction’s Harry Styles, Zayn Malik and Louis Tomlinson just can’t say no to the needle. 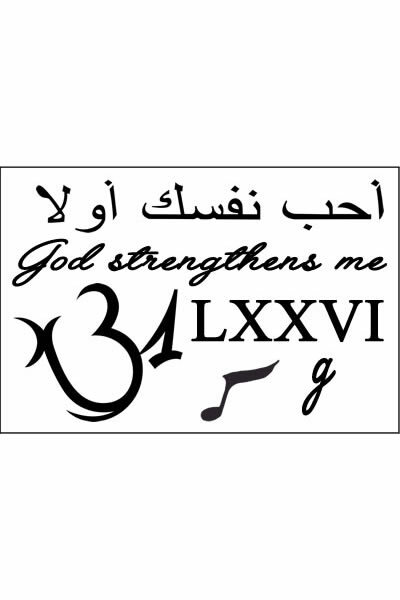 During a marathon tattoo session on August 10, 2013 that apparently lasted until 4:30 am, both Zayn and Louis added multiple tattoos to their collection, although Harry (the tattoo king with 40+ tats to his name already) was surprisingly absent. 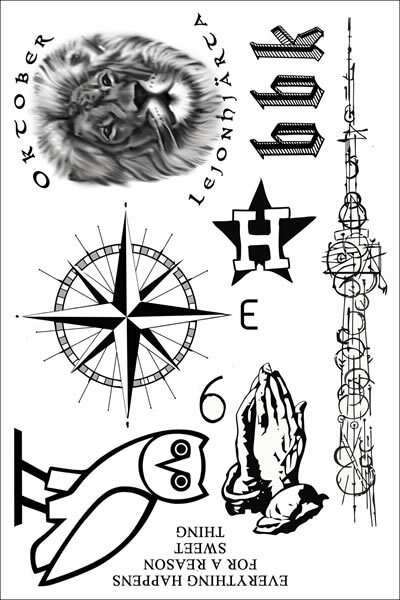 While Zayn Malik got three new tattoos as tributes to the One Direction boys and his pal Alex DeLeon, Louis opted for two kind of mysterious tattoos that follow the design of the seemingly random scribbles the One Direction boys are famous for. Zayn and Louis aren’t the only ones who got new tats at the L.A. tattoo shop though; Louis’ girlfriend Eleanor Calder and his mom (and possibly Liam Payne) also reportedly got inked! 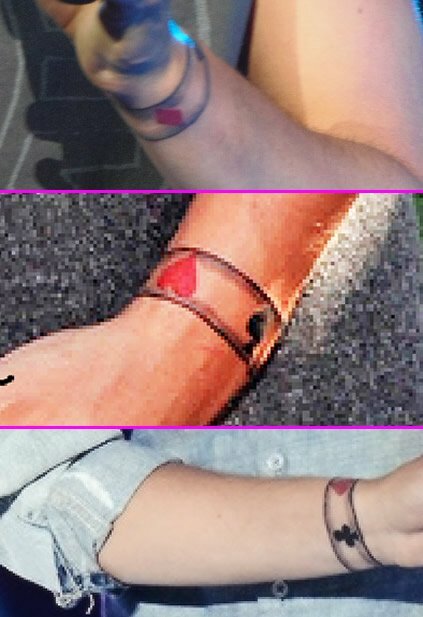 A little over a month after he got an infinity rope tattoo inked on his right wrist, Louis Tomlinson got another wrist tat – this one depicting a series of playing card suits in a band around his left wrist. 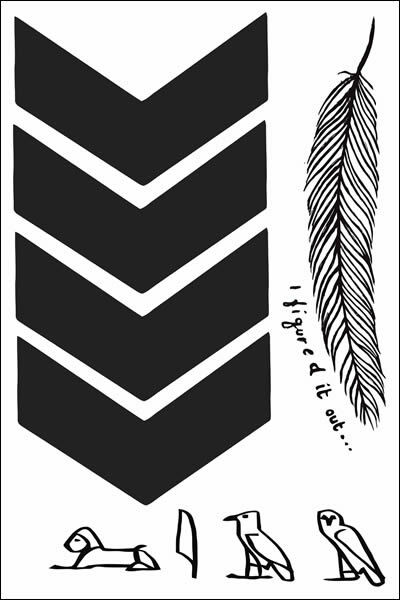 Of what he can see, Louis’ tattoo looks like it features a heart, club, spade and diamond inside of a band formed by two black lines encircling his wrist. 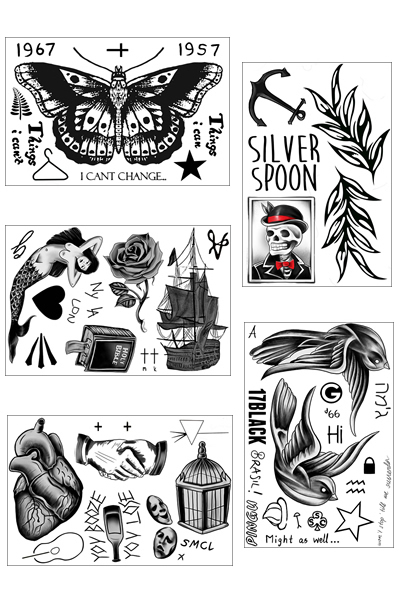 Louis Tomlinson’s tattoo was inked at the Shamrock Tattoo Parlor in Los Angeles, where many other One Direction boys have gotten inked recently. 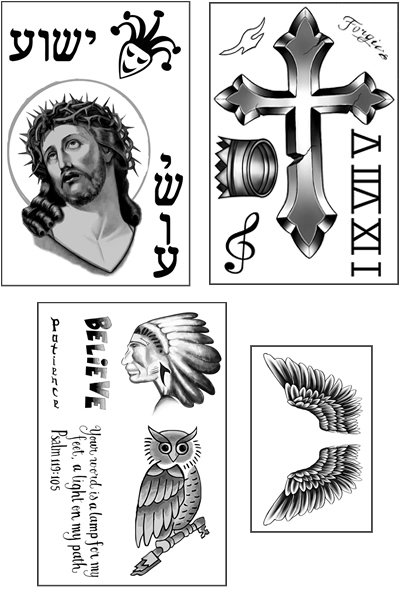 Louis’ wrist tattoo is oddly similar to one of Cher Lloyd’s tattoos – a series of playing card suits she has inked around her right wrist. 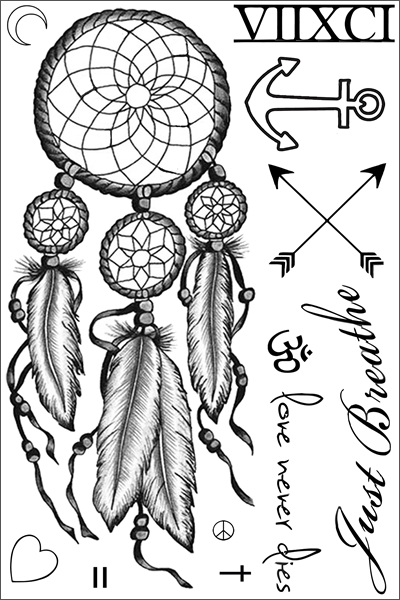 The funny thing is, Louis and Cher have another set of nearly identical tattoos – the stick figures on Cher Lloyd’s ankle and Louis Tomlinson’s arm. Hmm…it sounds like Cher Lloyd and Louis Tomlinson may be getting tattoo inspiration from each other! 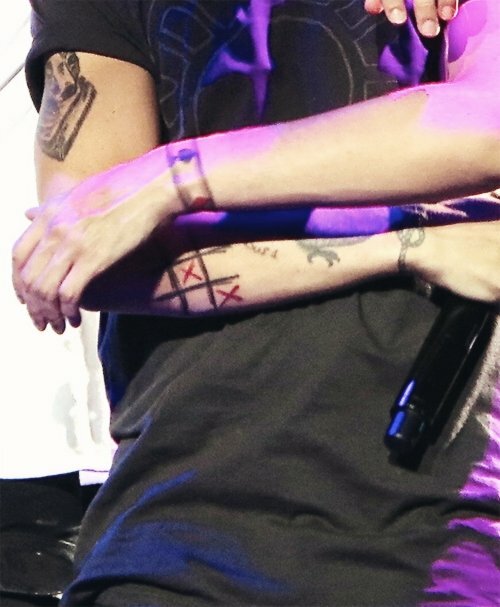 In addition to the playing card suits tattoo on his wrist, Louis Tomlinson also added a strange tic-tac-toe tattoo to the outside of his right arm. 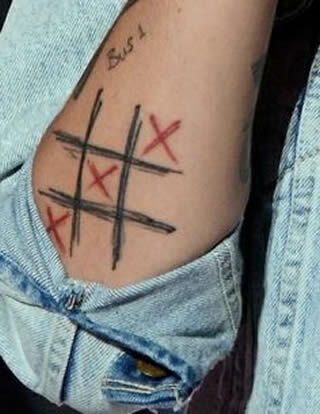 Louis’ arm tattoo depicts a rudimentary tic-tac-toe board inked with black scribbly lines and what appears to be three red “X” symbols arranged diagonally across the board for a clear win. 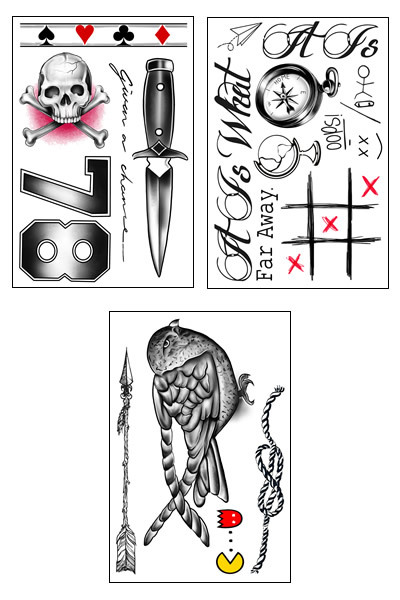 Judging by the inspiration behind many a One Direction tattoo – which is usually a phrase the boys like to say or something they like to do together – we’re going to take a shot in the dark and say that Louis Tomlinson’s tattoo is a tribute to a favorite game among the band members – tic-tac-toe.